The Triftbrücke (Trift Bridge) was recently built to cater to the demands of hikers, and what a hike it is: well worth the trip. It's a relatively easy trek between the cable car station and the bridge (though more avid folk can forgo the cable car & hike the full distance), with lovely views along the valley. 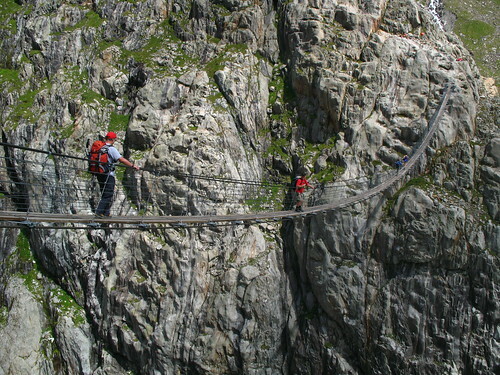 The last several meters to the bridge requires a bit of effort, but can be traversed by any able individual. 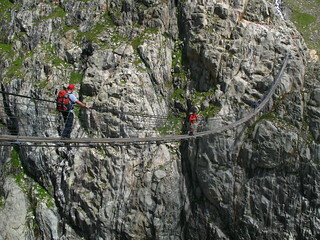 The other side of the bridge, however, takes a bit more climbing expertise -- a particularly entertaining journey.